The White Queen is a wicked one. You can just feel the tendrils sliding around inside of Firestar’s brain pan, and that’s even before she gets to using her mutant power. Emma Frost is setting this girl up right from the get-go, and you know it’s headed south before too long. This issue starts off with with a healthy dose of Butter Rum (a horse, unfortunately, not a drink.) With as much focus DeFalco places on this horse, I’d a feeling things would go from bad to worse, because that’s what the evil headmaster of the Hellfire Club has got going on. Miss Frost is keeping the rest of her prized students away from Firestar with the intention of causing a divisive rift between them. It works. Empath is certainly the worst of everyone’s problems, and is a special kind of jerk to her as they first meet. 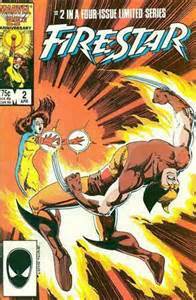 She trains Firestar alone, amping up the agony by pitting her against visions of Charles Xavier and Wolverine as she trains in Hellfire Club’s answer to the Danger Room. Emma Frost also ups the ante by inviting the New Mutants to the school for a social mixer. Firestar catches the eye of Cannonball, and through a little prodding, they exit the dance hall and are left to their own devices. Miss Frost has her fingers in a few pies, making this an absolute train wreck.